Diagenode focuses on state-of-the-art preparation of high quality biological and chemical samples by developing the industry’s most advanced water bath sonicators and hydrodynamic devices. Our instruments are ideal for a number of applications in various fields of studies including environmental research, toxicology, genomics and epigenomics, cancer research, stem cells and development, neuroscience, clinical applications, agriculture, and many more. The Bioruptor® uses a highly-controlled ultrasonic energy with ACT (Adaptive Cavitation Technology), a non-contact, parallel-processing and isothermal technology, to achieve optimal fragment sizes between 150bp-2kb which is ideal for chromatin shearing for chromatin immunoprecipitation (ChIP), genomic DNA shearing for next generation sequencing, and RNA shearing. In addition, the Bioruptor is perfect for cell and tissue disruption, protein processing for mass spectrometry, and much more. 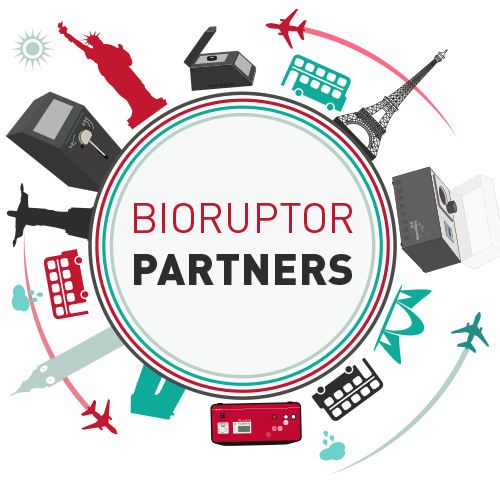 The Bioruptor is available in two models: the Bioruptor Plus, specifically designed for protein processing for mass spectrometry, high volume cell and tissue shearing, ChIP-qPCR, and other applications and the Bioruptor Pico for ChIP-seq and NGS. The One® is a unique desktop sonication device perfect for optimal small volume DNA shearing for Next-Generation-Sequencing in the 150bp - 1kb range. The Megaruptor® is a hydrodynamic shearing instrument for DNA shearing between 3kb - 75kb and represents the best shearing device for the tightest distribution of long DNA fragments for applications such as long fragment sequencing.